The most destructive of innings from David Willey carried Northants Steelbacks to NatWest T20 Blast finals day with a seven-wicket quarter-final win at Sussex Sharks. Willey hammered an incredible 100 from just 40 balls - the joint eighth fastest ton in the history of 20-over cricket - as the Steelbacks cruised to their victory total of 166. The England star had earlier bowled brilliantly, taking three for 27 as Sussex were pegged back following a fast start from Chris Nash (53) and Mahela Jayawardene (50). Having been 92 for two from 9.2 overs, the Sharks started to drown under the weight of the Steelbacks bowling, with the fielding also exceptional. And Willey then took charge as Northants booked their place at Edgbaston, where they won the T20 competition in 2013, on August 29. The Steelbacks had been handed an away tie in the last eight after finishing third in the North Group, and they knew early wickets would help their cause at Hove. And Willey delivered what his team wanted as, after Nash had taken eight from Rory Kleinveldt’s first over, the all-rounder struck, getting rid of dangerman Luke Wright. The Sussex skipper drove the ball into the hands of the diving Olly Stone, who took a fine catch to ensure Wright departed without scoring a run. Willey almost got Jayawardene with the following delivery as the Sri Lankan star chopped at the ball, which just missed the stumps. Jayawardene was to make most of the reprieve, grabbing two boundaries off Willey’s next over and taking Stone, who shipped 17 runs in his first, to task in the next. The veteran batsman was turning on the style, helping Sussex build on a powerplay that brought 53 runs. And he quickly brought up his own half-century, from just 30 balls, as the Steelbacks were submerged in boundaries. But Jayawardene was to be denied by a moment of brilliance from Josh Cobb, who claimed a stunning one-handed catch running round the boundary. The 38-year-old had fallen for 50 to Muhammad Azharullah and the Steelbacks were desperate to ensure that wicket helped stem the flow of runs. They soon had another dismissal at the end of an excellent over from Stone, who got Australia batsman George Bailey LBW for five. But Nash continued to tick along and he reached his half-century in 33 balls thanks to a misfield from Rob Keogh on the boundary. However, just like Jayawardene, reaching the 50 mark proved to be his undoing as Kleinveldt got him LBW with a fine delivery. And Kleinveldt was soon celebrating again as he bowled Craig Cachopa with another good yorker. Chris Jordan was really struggling to connect properly and he soon followed Cachopa back to the dug-out as Steven Crook took the catch off Willey. Azharullah kept it tight in the penultimate over and Willey then claimed his third wicket in the final one, with Kyle Coetzer taking the catch to get rid of Will Beer. 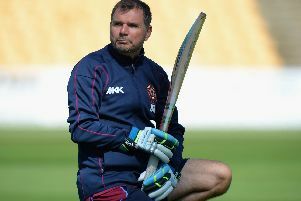 The Steelbacks had fought back superbly, but knew they would need to show the same level of steel with the bat. And after a tentative first two overs, Willey started to go through the gears, smashing 18 from Jordan’s opening six deliveries. He then took a liking to Chris Liddle, following a four with a huge six out of the ground to move to 40 from just 20 deliveries. The Steelbacks ended the powerplay 60 without loss and Richard Levi then started to click, with one square leg six particularly eye-catching. Sussex then turned to spin, bringing on Will Beer, who took a wicket with his first ball as Levi was caught LBW for 24. But Willey bit back in the next over. The England man hit a stunning 34 from Yardy, with five sixes and one four coming from the six deliveries. And he was to go to a hundred in just 40 balls, as an apt six got him to three figures. He was to go soon after as Tymal Mills finally got his man and Ben Duckett also headed back to the dug-out after Beer had him caught by Nash for five. But Cobb and Alex Wakely saw the Steelbacks home with ease to secure a memorable victory on the south coast and keep the hopes of glory alive.